Multiple wolverines were documented this year by the Citizen Wildlife Monitoring Project and the Cascades Wolverine Project, adding to knowledge about the animal’s return to Washington. 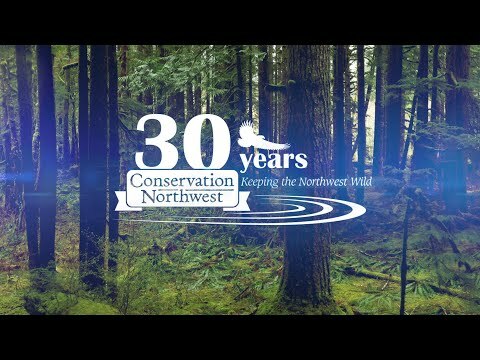 About a hundred volunteers are involved in wildlife monitoring and citizen science every year through Conservation Northwest’s Citizen Wildlife Monitoring Project (CWMP). Over the course of the spring and summer, a few lucky volunteer teams have documented multiple wolverine in the North and Central Cascades, adding to our local knowledge of this iconic species in these areas! Our non-invasive survey methods attract and photograph animals using a scent lure, drawing on their natural instincts to seek out smelly things as a potential food source. While visiting the site a wire brush can collect hair samples from the animal rubbing on it. Valid samples add information to a database researchers have for better understanding our regional wolverine population size and dispersal. As the project coordinator, I wanted to find out from the volunteers themselves how detecting these rare carnivores at their camera stations and engaging with the CWMP had changed their way of viewing conservation efforts in the Pacific Northwest. I wanted to know our volunteers’ take on our efforts as citizen scientists who on occasion get the opportunity to collaborate with state biologists and researchers who are studying these animals. Along with these teams volunteering through our Citizen Wildlife Monitoring Project, Conservation Northwest has also partnered with the Cascades Wolverine Project, led by David Moskowitz and Steph Williams. Their efforts spanned six months of monitoring, setting seven different wolverine camera stations throughout the thick of winter and detected wolverines 11 times, contributing to larger statewide efforts, research and knowledge about wolverines in the Cascades. Check out one video from their project below! We are proud to support efforts like these, and want to sincerely thank all of our volunteers who have contributed countless hours to this project. The efforts our volunteers contribute to installing and maintaining numerous camera sets, as well as keeping our data up to our high standards is directly transferable to increased value and knowledge of wolverines and other rare species as we partner with different agencies across Washington and southern British Columbia. We’ll be putting out a full report on this year’s remote camera season later this fall. Past reports are also available online. Want to support this citizen science effort? Please consider a donation!